All the doubting Thomases must by now be aware that Chishimba Kambwili and Mwenya Musenge have been expelled from the Patriotic Front. When we broke this news in the afternoon we were as usual called names by PF bloggers. Now that Kambwili himself has confirmed and PF cadres are busy trying to come to terms with this development, we say enjoy the drama in the Plunderers Family (PF). As for us we knew and now we are changing course. We want to warn Kambwili of what to expect. Others will wonder why we are being friendly to CK as many call him when he vowed to crush us the first time he was appointed Minister of Information. We have never hated any politician per se. We only despise what they do when they think they have power.We are around even today and we do not celebrate over what has happened to him. This platform is for the marginalised. We actually told Kambwili that we shall continue doing what we do long after he loses his government position. Even those staunch abusive PF bloggers who insult us everyday will one day use this platform. When Edgar Lungu will be arrested for treason, we shall be here to write about it. Yes, Lungu will one day be arrested for treason. One of the clearest treasonable offences Lungu committed was to refuse to step aside and handover power when the presidential petition was lodged in the constitutional court. That was clear treason. 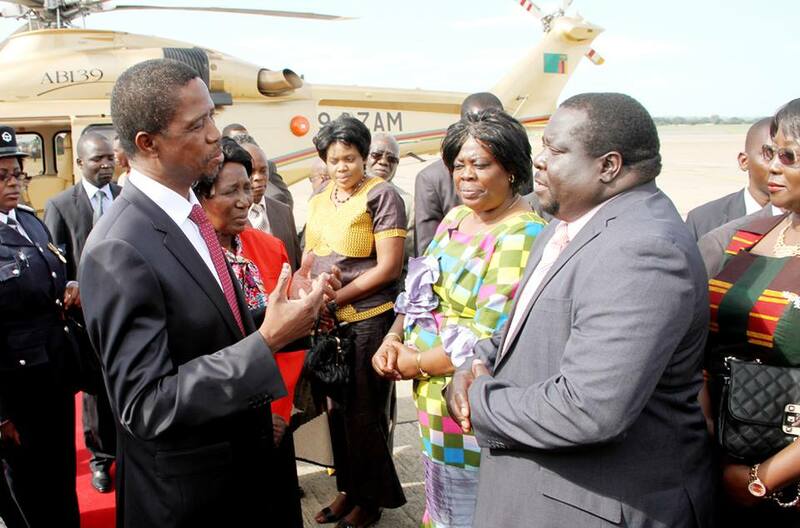 There is simply no way Lungu will accept that unless he dies in office. When Amos Chanda and other presidential aides are arrested for corruption and abuse of office, we will be here to document it. Now that you have been expelled, be extremely careful with the way you expose the corruption that you condoned while in PF starting from State House to the District Commissioner. We are in the know that you have a dossier on Lungu and the entire cabinet starting from very big tips from Avic International, Petroleum suppliers and so on. Ba Kambwili where you around the time Paul Tembo was assasinated by the Chiluba regime? to be fair, assasinated by Chiluba? Paul Tembo was an emissary for Chiluba’s third term. He went round the country dishing out money campaigning for Chiluba. What he did not know is that Chiluba had a line up. He wanted Kavindele to be his Vice. Paul Tembo was National Treasurer but thought he would be Chiluba’s vice . Whilst campaigning for Chiluba, Tembo was also campaigning for himself for the Position of Vice President meanwhile using ” Chiluba’s” resources. When the MMD convention started at Mulungushi in Kabwe, Chiluba told Kavindele to vie for the position of Vice President. Paul Tembo also stood on the same position despite Chiluba discouraging him. He won the elections but Chiluba had to rig by one vote and Tembo was very annoyed. He called for a Press Briefing to Spill the Beans. Did he spill the beans? NO. He was assasinated the day before the briefing. They picked up his Wife also bu she was released after some time and left for South Africa. We hear she even had an affair with Zuma. When the matter was supposed to commence in the High Court, the State Witnesses who were supposed to testify all died in a road accident near Kafulafuta in Ndola. WHY WAS TEMBO KILLED? Tembo was killed because as National Treasurer for MMD, he knew how the money was being raised. Just as Edgar Lungu is getting huge sums of money from Avic, Chiluba got money from Phoenix Contractors. This was the biggest construction company in Zambia. Ask Elias Mpondela. He was marketing Manager. Ask Overs Banda. He was Permanent Secretary in the Ministry of Local Government Phoenix like Avic was given a contract to do township roads but the time of Chiluba such projects were under local government and Overs Banda was PS. Even now Overs Banda is the Lawyer for Avic. The people you have left behind in that Central Committee know you know their deals. We are not asking you to be a coward but to be careful. The people sorrounding Lungu in terms of scheming are the same who schemed with Chiluba. We know them. We hope you will manage even to have that briefing tomorrow with this state of emergency. By the way did you vote in favour of the state of emergency in parliament? Do you support the state of emergency by now? We shall know the answer by tomorrow. But We can advise you on how to secure that information. Give it to the Zambian Watchdog. We will keep for you. Since you can not get to us like you promised when you were a Minister, just post on your Facebook page then we will know how to collect the data. For now careful. If Levy Mwanawasa rose from the dead today, the entire PF cabinet would be lining up at the Magistrate Court with Lungu in front.